OBJECTIVE: Robotic-assisted prostatectomy for prostate cancer is increasingly performed. A subset of these patients presenting for prostatectomy also have inguinal herniae. Simultaneous surgical intervention of these conditions could provide several advantages. 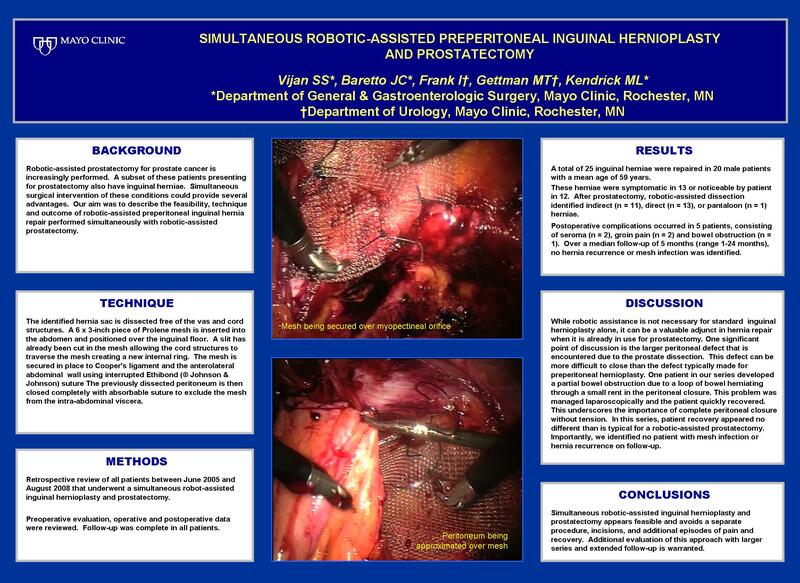 Our aim was to describe the feasibility, technique and outcome of robotic-assisted preperitoneal inguinal hernia repair performed simultaneously with robotic-assisted prostatectomy. METHODS: Retrospective review of all patients between June 2005 and August 2008 that underwent a simultaneous robot-assisted inguinal hernioplasty and prostatectomy. RESULTS: A total of 19 inguinal herniae were repaired in 15 male patients with a mean age of 61 years. These herniae were symptomatic in 11 or noticeable by patient in 4. After prostatectomy, robotic-assisted dissection identified indirect (n = 12), direct (n = 6), or pantaloon (n = 1) herniae. All hernioplasties were constructed in a preperitoneal fashion using Prolene mesh secured with intracorporal suturing. Closure of the peritoneum was performed to isolate the mesh from abdominal viscera. Postoperative complications occurred in 3 patients consisting of seroma (n = 2) and bowel obstruction (n = 1). Over a median follow-up of 5.8 months, no hernia recurrences were observed. CONCLUSIONS: Simultaneous robotic-assisted preperitoneal inguinal hernioplasty at the time of prostatectomy is technically feasible, avoids separate procedures and recovery, utilizes available technology, and is a suggested approach for patients with resectable prostate cancer who present with inguinal herniae.